MOSCOW, May 16. /TASS/. Russia is not afraid of new Western sanctions that could be imposed in connection with the opening of the Crimean Bridge, Russian Deputy Foreign Minister Grigory Karasain said on Wednesday. "We do not fear any sanctions," he stressed answering a question from a TASS correspondent. "Imposing sanctions on us is tantamount to teaching us to work more efficiently." US State Department Spokesperson Heather Nauert told reporters at a press briefing on Tuesday that the US is concerned about the fact that the construction of the bridge allegedly hinders the navigation and delivery of goods by sea. In a separate written statement, she pointed out that Washington condemns the construction and partial opening of the Crimean Bridge, which was done without the Ukrainian government’s authorization. 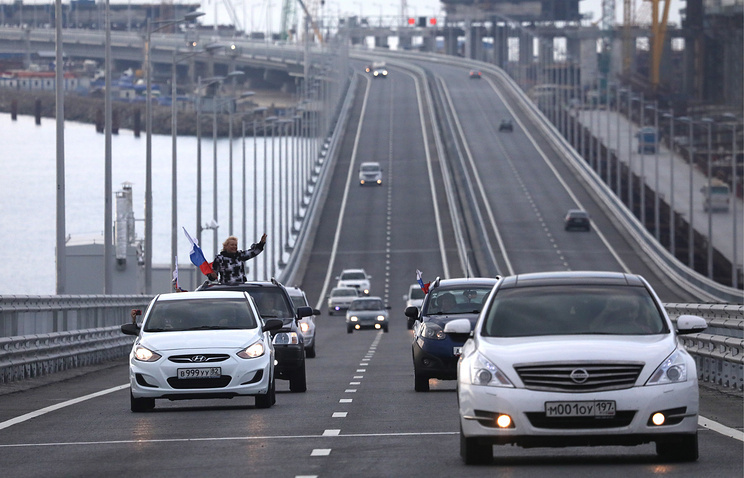 Russian President Vladimir Putin took part in the opening ceremony of the Crimean Bridge motorway section Tuesday, driving the lead vehicle of the construction equipment convoy. The construction of the bridge connecting Crimea to the Russian mainland kicked off in February 2016. The construction of its railway section continues, its opening is scheduled for 2019. The Crimean Bridge originates on the Taman Peninsula, runs through a five-kilometer dike area and the Island of Tuzla, then crosses the Kerch Strait and reaches the Crimean coast.